This fishery dates right back to the "old days" and remains very popular with the pleasure and match angler. 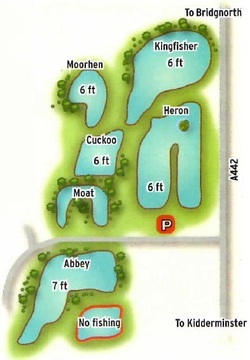 There's a choice of six lakes offering over 200 swims. The fishery is rightly proud of its proper English carp stocks - they run to 25 lb, with bream to 9 lb, tench to 6 lb, perch to over 4 lb, roach nudging 2 lb and rudd to 1 lb. These stocks apply to Heron whilst Kingfisher, although similar, has fewer bream but pro rata more carp. Kingfisher and Heron would be the pick for silver fish too. Moorhen and Cuckoo are pleasure lakes only and along with Moat, the oldest lake on-site, are similarly stocked to Kingfisher. Abbey is stocked much the same but with catfish to 57 lb as well, that fish was reported two years ago so could be much higher now. For mixed catches, mainly average-sized carp, tench, bream and skimmers, float fish soft pellet or chopped worm over regular but small amounts of loose feed. Simply try bigger pellets for the bigger carp. Feeder fished redworm is also recommended on Heron. Float fish corn on any of the lakes for the tench. Likewise, for the chance of a big perch, try lobworm over chopped worm or prawn. Try a big chunk of legered luncheon meat for a catfish. Anywhere really, depending on local weather conditions. (Under-16s must be adult accompanied at all times). Fishing 8:00am to 5:00pm in the winter and 7:00am to 9:00pm in the summer. No night fishing. Disabled access. Barbless hooks only. No keepnets. Poole Hall Fisheries is halfway between Kidderminster and Bridgnorth on the A442. About seven miles from each.